After the long and hot Spanish summer, We are Back at Campus Madrid for the last part of 2017. We are excited to have a Carlos Ferrando, founder and CEO of Closca. CLOSCA was born to add a touch of style, design and good taste to both their customers and the cities where they live. It is a company that always with the people who appreciate beauty, are not intimidated by change and feel the inevitable need to change things. Their most famous product is the Fuga Helmet that being sold in shops around the world such as the MoMa, Centre Pompidou and others. 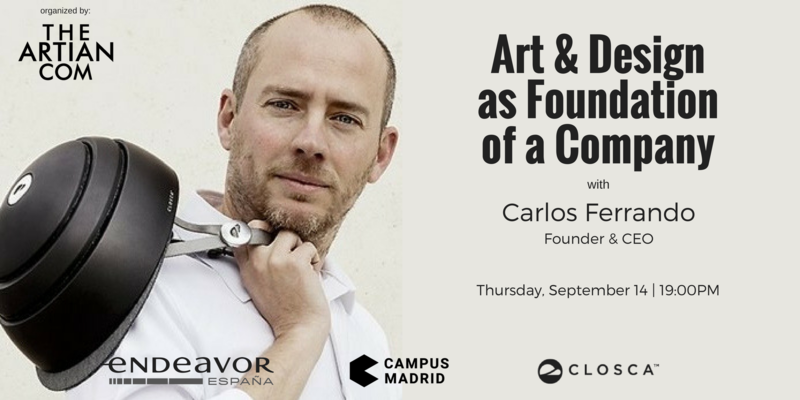 In this talk, Carlos will share the story of the foundation of Closca, how art and design inspired him to build a unique company culture that translates into its products. Carlos Ferrando – Founder & CEO, Closca. Ferrando is a creative genius born in the city of Valencia, Spain. After studying Industrial Engineering at Polytechnic University Valencia (1996-2003), Carlos served as Product Manager and Supply Chain Operator for various manufacturing companies in Spain. After seven years, he went to see a life-coach who reawakened him to his true calling: entrepreneurship. Wasting no more time, Carlos pivoted to product marketing and obtained a Master’s Degree in Sales from the Lancaster University Management School at age 35. The event is in collaboration with Endeavor Spain. Endeavor is the only non-profit that supports high-impact entrepreneurs around the world. Their “mentor capitalist” model breaks down economic and cultural barriers to entrepreneurship through advising from their network of world-class business leaders. With their guidance, their 1000+ Endeavor Entrepreneurs throughout Latin America, Africa, the Middle East, Southeast Asia and the U.S. have created 400,000+ high-value jobs and generated $6.8 billion in 2013.